K9Immunity, K9Immunity Plus and Apocaps are all natural supplements that have helped over a MILLION canine cancer patients. 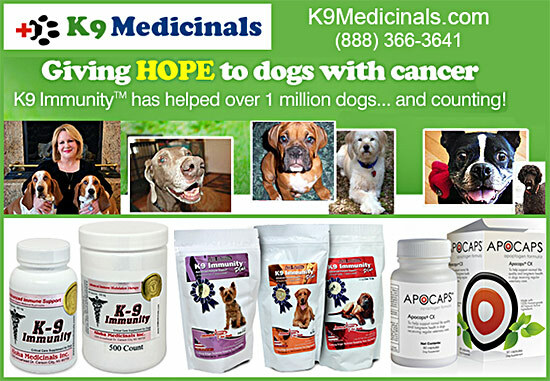 What Sets K9Medicinals.com and Dogcancer.net Apart From Competitors? Making it more pleasant for your dog, K9 Immunity Plus comes in easy to chew wafers with natural liver and fish flavors dogs love. Apocaps®, the powerful nutraceutical supplement designed by Dr. Demian Dressler, DVM, author of The Dog Cancer Survival Guide is now available for dog lovers in stores, at vet offices, and online. This is the same apoptogen formula supplement that Dr. Dressler developed for and uses with his canine patients at his veterinary hospital in Hawaii. Apocaps® is made in the USA with 100% human-grade, all natural ingredients. Apocaps is a giant leap in dog health innovation. Using pure, 100% human-grade, all-natural active ingredients, the patent-pending Apocaps CX formulation helps dogs by unlocking a natural biological process in the body called apoptosis. What Symptoms Should I Be Aware of For Canine Cancer? Note: Don't panic if your pet exhibits one or more of these signs. Quite often it is nothing to be concerned about, however cancer in canines can grow quite rapidly, so if it is cancer it is important to have it diagnosed as quickly as possible and begin a course of treatment if you choose. Dogcancer.net is our sister site with additional information about canine cancer. You will find additional valuable information to help support you while you work to help your dog. Order Your Cancer Wellness Products For Your Dog Today! While we are not claiming a “cure” for cancer— as one does not exist yet, the products at K9Medicinals can help extend the comfort and often add months or years to your dog’s life. Early use of these products can have an even greater effect. Don’t wait! For more information about our product line and how it could benefit your canine, please call us today!